The CIGS solar company has inked a deal with Umwelt-Sonne-Energie, one of a growing list of buyers in Europe. No update yet on Solyndra's new factory plan. Solyndra just added one more contract to its already ballooning backlog: The thin-film solar startup has signed a $238 million deal with Umwelt-Sonne-Energie in Germany. The Fremont, Calif.-based Solyndra now has more than $2 billion in contracts that it plans to deliver over the next several years, the company said Tuesday. The agreement with Umwelt-Sonne-Energie in Germany would last through 2013. Solyndra, founded in 2005, began to discuss its technology and product publicly last fall. Instead of a flat-plate panel, the company's module is made up of a series of tubes that contain solar cells. The solar cells make use of copper, indium, gallium and selenium (CIGS) for converting sunlight into electricity. Solyndra is one of a handful of CIGS companies that have rolled out commercial products. Its target customers are businesses rather than homeowners. It's not just the unusual design that has garnered Solyndra a lot of the spotlight. It's the combination of the panel design, along with its racking system, that makes it able to shave installation costs for installers, said Andrew Skumanich, founder of SolarVision Consulting in Silicon Valley and a former executive at Applied Materials and Innovalight. The tubes are placed an inch apart in a frame, so it's more wind resistant than conventional solar panels and can withstand winds up to 130 miles per hour, Solyndra's CEO Chris Gronet said last fall (see Solyndra Rolls Out Tube-Shaped Thin Film). 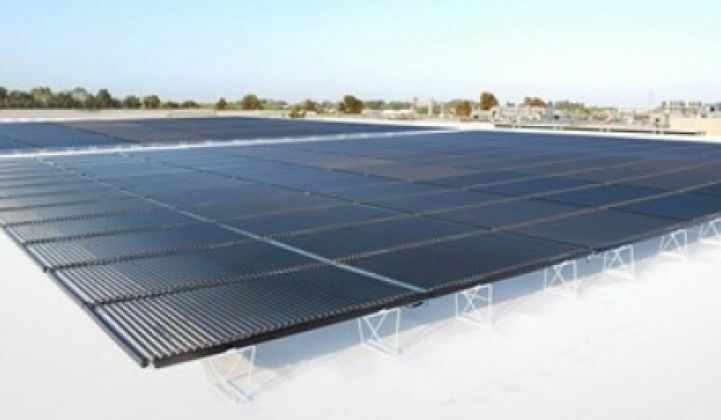 A Solyndra system is meant for flat or only slightly tilted rooftop, and its racking system doesn't require ballasts or roof penetration for anchoring, the company said. Armageddon Energy, for example, has developed hexagonal solar panels and a triangular frame to go with them (see An Idea for Solar?). Solar Red also has designed a racking system that its developers say would make installing panels a snap (see Getting Solar Energy Cheap and Easy). Solyndra has attracted a good number of European distributors and installers so far. Aside from the deal with Umwelt-Sonne-Energie, its previously announced deals included a $115 million supply agreement with Ebitsch Energietechnik in Germany, a $189 million deal with SunConnex in the Netherlands, and a $250 million contract with GeckoLogic in Germany. One of its first customers was Phoenix Solar in Germany. Umwelt-Sonne-Energie does business in Germany and Eastern Europe. Solyndra is set to receive a $535 million loan guarantee from the U.S. Department of Energy for building a 500-megawatt factory near its current headquarters. The loan guarantee would enable the company to borrow money from the Federal Financing Bank. The DOE announced the loan guarantee in March this year, and Solyndra hasn't said whether it has secured the money to begin construction. The company said earlier that it would like to start building by the end of this year and start delivering panels from the factory in early 2011. The company already has a cell and panel factories with capacities to produce 110 megawatts of solar panels per year, but the company hasn't disclosed whether it had achieved that production rate.